The What: Extron Electronics has launched the SMP 111, a high-performance recording and streaming processor for capturing and distributing AV sources and presentations as live streaming and recorded media. The What Else: The SMP 111 accepts an HDMI signal with embedded audio and an analog audio signal. 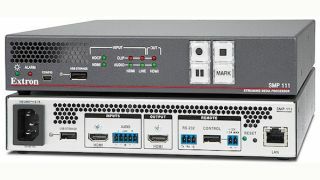 Extron high-performance scaling and flexible signal processing enable display of content of varying resolutions from computer and HDTV sources. The SMP 111 supports extensive streaming capabilities. It can record and stream simultaneously, with independent resolutions and bitrates using a range of transport protocols and session management options. Recording with the SMP 111 provides easy capture of live HDMI signals to an internal flash drive and external USB drives. Optional RCP 101 Series remote control panels are available to extend both front panel control as well as USB connectivity for thumb drive recording media. Requiring no licensing fees, the SMP 111 is a compact, flexible solution for streaming and recording content. "In response to requests from customers, we’ve continued to expand our line of H.264 streaming products with the addition of the SMP 111, a compact, single-channel H.264 streaming media processor," said Casey Hall, vice president of sales and marketing for Extron. "Supporting RTMP streaming now allows our customers to easily implement live streaming to YouTube, Facebook Live, and other streaming services while simultaneously making high-quality recordings." The Bottom Line: The SMP 111 is designed for applications that require simple recording of a single video signal with audio and metadata. It provides MP4 or M4V file format recordings integrated with metadata, chapter, and event marking. It is also well suited for applications that require live streaming to remote participants, hosting services, or local confidence viewing. The SMP 111 can be adapted to many applications, documenting virtually any meeting, conference, or activity that uses an AV source as a reference. The SMP 111 is ideal for use in corporate, education, government, and rental and staging applications.